Give your look a luxurious detail with the Ross & Snow® Angelina Bootie. Heeled ankle boots feature a leather upper with plush shearling cuff. Real fur: dyed shearling from lamb originated in Iceland. 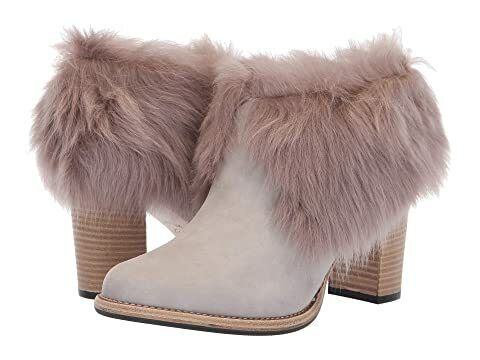 We can't currently find any similar items for the Angelina Bootie by Ross & Snow. Sorry! SO thrilled with these! Have never felt anything so comfortable and warm while still being fun. Receive countless compliments every time I wear them. These are super cute but not really pink at all. More of a grey. They fit well and are surprisingly comfortable.